There's a record being set this year in Yosemite National Park, a record of death! In the first 8 months alone 17 park visitors have passed away. In a lot of cases it's due to the rivers being higher than normal thanks to a healthy snow-pack from this past winter. A few hikers have fallen off the famous face of Half Dome. A few got caught up in swollen rivers and drowned. One man slipped from mist slipped on the granite steps of the Mist Trail below Vernal Fall and drowned in the swollen Merced River. 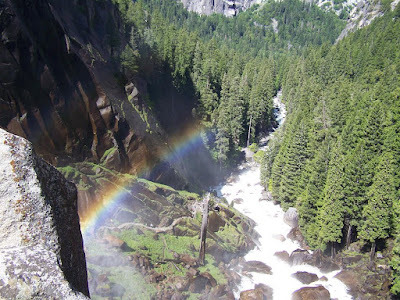 Mist Trail is a steep, 1.5-mile-long trail which attracts upwards of 1,500 visitors a day. It's also been busy at Yosemite with over 730,000 visitors in the month of July alone. That's the most in any one month since 1985! So given the higher crowds and swollen rivers it's easy to see how more accidents are happening. But if you make it to Yosemite, or to any national park, just play it safe. Falling down 2,500 feet in front of astonished hikers to your death is just not a fun way to spend a vacation! BONUS LINK: http://www.nps.gov/yoursafety. <--tips on how to be safe in Yosemite.